W.F.K. (Warsaw Courier Fund) is a non profit organisation that aims to help cycle couriers injured during their work. W.F.K. is managed for couriers by couriers. In the case of an accident that occured at work, fund provides a courier with a financial help for the time he or she is unable to work. 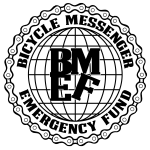 The fund membership is fee based, but most money is raised through merchandise or during cycle related benefit evens such as: alleycat races, goldsprints. You can support us directly by buying our merch in our friend’s webstore (all money collected there is proceeded to WFK). We are also open for sponsorship. If You want to know more, write!